One of the problems with converting 1:32 scale farm and plant machinery to radio control is the lack of space to house batteries. You are usually limited to 100 or 200 mAh depending on the model and what you have added. An easy way to get around this drawback is to add extra batteries in your accessories. 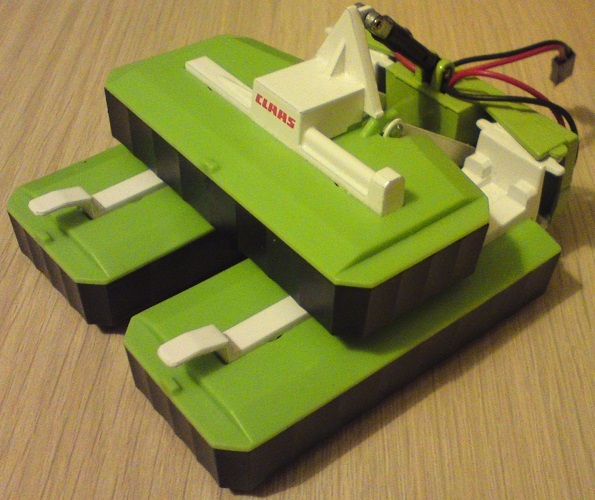 The Class Butterfly Mower battery pack was one of my first conversion and used AAA batteries which I originally used with my Massey 8680 and Fendt 936 before I converted them to 3.7 V. I have since converted it to house two 3.7 V 650 mAh LiPo batteries so it is ideal for my newer designs. One advantage to the Class Butterfly Mower as a battery pack is that the weight hanging over the front of the model improves the steering greatly by increasing the traction of the front tires. Initially I taught the best way to build this battery pack would be to use AAA batteries. I bought five single AAA battery holders, removed the plastic cutting disks from inside the mower and glued the battery housings in place.Â I then ran the wires around the body of the mower, wiring the five batteries in series to give around 6 volts. I was very happy with the results, this battery pack turned out perfectly however there were a few issues. It was not long before I realised that charging the AAA batteries was a bit of a pain, for starters the charger only took four at a time. The six volts also caused some issues with voltage regulation too, it was too high for the microcontrollers and was too low for most voltage regulators. Then I upgraded the models to run off 3.7 V so using the 5 AAA batteries was no longer an option. I removed the AAA battery holders and upgraded the mower to house two 650 mAh 3.7 V LiPo batteries connected in parallel to give me 1300 mAhs at 3.7 V. Each battery is located in one of the outside mowers and now this battery pack can be connected directly to my RC Tractors. The central mower was now empty so I added a 555 Timer whichÂ would flash twoÂ LEDs at the extreme of each outside mower acting as a warning beacon just to add a little extra feature to the battery pack. There is a switch to turn the LEDs on and off when not in use and the resistor on the LED is relatively high so it doesn’t waste too muchÂ power. I did a video of the latest upgrade of theÂ Class Butterfly Mower battery pack when I added the LiPo batteries.